Core Plus Aerospace is a two-year high school manufacturing curriculum that prepares students for high-demand jobs through hands-on learning. Students learn real-world skills that open doors to good-paying manufacturing jobs and give them a clear advantage when pursing apprenticeships, post-high school certificates, or college degrees. Developed and supported by industry leaders like Boeing, Core Plus Aerospace is designed to be delivered in an engaging classroom setting and provide opportunities for students to explore careers in industries that they might be of interest while still in high school. There are nearly 300,000 direct manufacturing jobs in Washington state, and a large portion of the state’s manufacturing workforce will be eligible for retirement in the next few years. The door will be open to a new generation of employees. We want to help more Washington students get ready for those opportunities. Through Core Plus Aerospace, students will gain the real-world skills they need to launch their careers in this thriving industry. 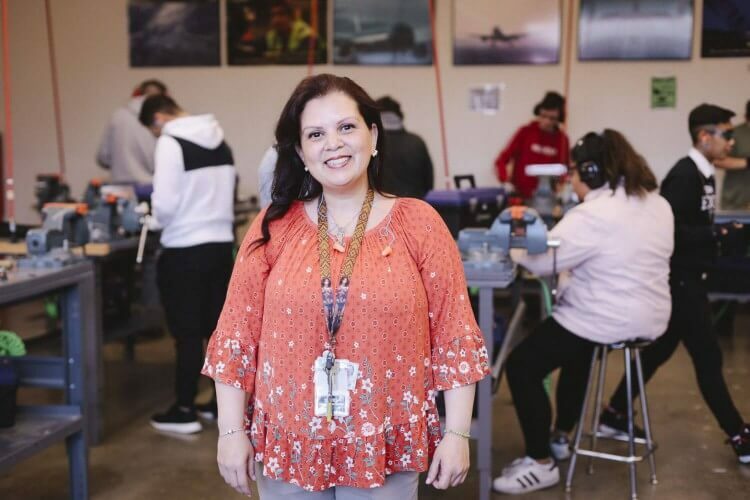 They all have a clear advantage when pursuing apprenticeships or certificate and degree programs at two- and four- year colleges. The first year of Core Plus Aerospace’s two-year curriculum focuses on manufacturing skills common across all industries, such as materials science, precision measurement, and use of hand and power tools. Students can take these skills and pursue employment or continuing education in any number of industries from aerospace to maritime, agriculture, construction, and more. The second year consists of industry-specific courses in aerospace. This includes coursework in areas such as fiber optics, advanced composites, robotics, and more. See a Core Plus Aerospace class in action here. Along with manufacturing skills, Core Plus Aerospace students learn universal skills such as time management, problem solving, and team building. There are also opportunities to engage in clubs and competitions through organizations like Skills USA and First Robotics. Core Plus Aerospace graduates finish with an industry-backed Certificate of Competency that defines the skills they mastered and is a clear signal they are ready for manufacturing careers and post-high school education or training. Core Plus Aerospace is a resounding success among its students as well as the employers and apprenticeship and college programs that welcome its alumni. More than 150 high school graduates who participated in Core Plus Aerospace programs were hired at Boeing in 2018. Those new employees also can pursue college or other post-high school training, paid for by Boeing. Graduates also go on to work for other employers and pursue apprenticeships, post-high school certificates, and degrees. 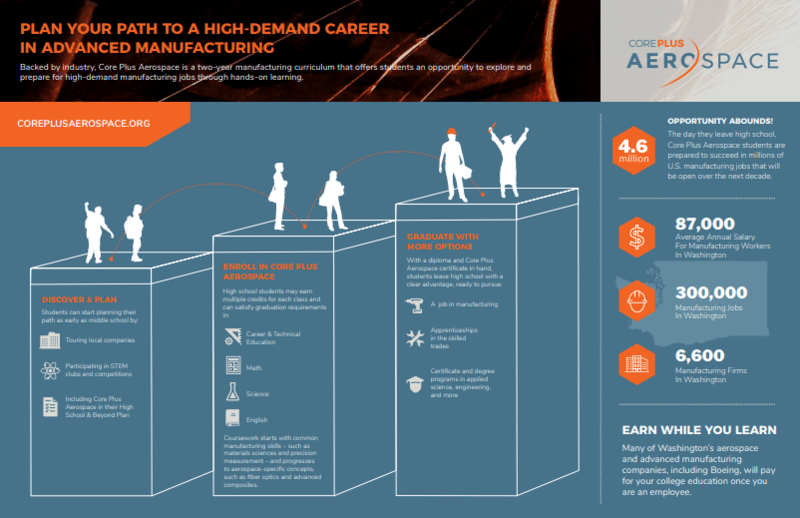 Learn more about postsecondary and career pathways from the Center of Excellence in Aerospace & Advanced Manufacturing.